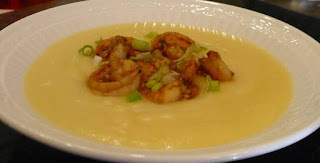 On to day #2 of Soup Month, we have a silky smooth Golden Potato Soup with Sriracha Spiced Shrimp on top. This is a relatively easy soup to make, requiring just a few minutes of prep time. The original recipe from Food & Wine magazine called for Turkish red-pepper paste as the base seasoning for the shrimp but, since I could not find any here in our small town, my husband decided to use his spice magic on the shrimp and they turned out great. Just the right amount of spice to compliment the mild potato soup. Why use 2 varieties of potatoes? The Yukon Gold is a boiling potato which contains less starch and sugar and also gives this soup its beautiful color. When you combine the 3 Yukon potatoes with 1 regular Russet potato, which is higher in starch and will add a little fluff to the recipe, you get the perfect combination of silkiness and just a bit of starch to thicken the soup. This elegant soup would be perfect for the first course at any holiday dinner, and would be delicious served before a Beef Standing Rib Roast. Enjoy! In a large pot heat 1 TB olive oil. Add the shallot and just a pinch of salt and cook over medium heat, stirring occasionally, until softened, about 5 minutes. Add the diced potatoes and cook 5 minutes. Add the chicken broth and simmer over medium heat until tender, about 15-20 minutes. Meanwhile, in a small bowl combine the shrimp, basil, garlic, 2 TB olive oil, Sriracha sauce, balsamic, cayenne and paprika. Set aside to marinate while the potatoes are cooking. When the potatoes are tender, use a slotted spoon to scoop the shallots and potatoes into a blender. Strain the remaining broth into a saucepan, and carefully add 1 cup of the broth to the blender. Puree the soup until smooth, then add the puree to the saucepan with the broth. Add just a pinch of salt, to taste and stir until the broth and puree are combined. Using a small skillet, add the shrimp mixture, and cook shrimp over medium-high heat, about 4 minutes or until shrimp are pink and slightly curled. Ladle the soup into bowls and top with several of the cooked shrimp and a sprinkle of green onions for garnish. Serves about 3 as a main meal with a side salad, or serves 6 as an appetizer or first course.